The term "photomechanics" describes a suite of experimental techniques which use optics (photo) for studying problems in mechanics. The field has been in existence for some time, but has always lagged behind other experimental and numerical techniques. The main reason for this is that the interpretation of data, which whilst providing whole-field visualization, is not in a form readily amenable to the end-user. Digital image processing has become common within the photomechanics community. However, one approach does not fit all, and subtle variations in technique and method have been developed by different groups working on specific applications. This primer enables the user to get started with their experimental analysis quickly. It is based on the universally popular MATLAB® software, which includes dedicated and optimized functions for a variety of image processing tasks. These can readily scripted, along with the necessary mathematical expressions, for particular experimental techniques. 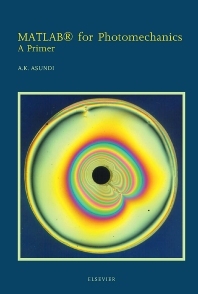 The book provides an introduction to some of the optical techniques, and then introduces MATLAB® routines specific to the image processing in experimental mechanics. There are also case studies on particular techniques. As part of the book, a collection of M-files is provided on CD-ROM, which also contains example images and test code. This provides a starting point for the user, who can then easily add or edit statements or function for their own images. For Graduate and Undergraduate Students working in the field of photomechanics. Also for lab projects introducing optical methods for stress analysis. Students in areas of thermal and fluid mechanics where optical methods are used. Selected papers. Introduction. Principles of optical methods. Photomechanics. Introduction to MATLAB®. MATLAB® for image processing. MATLAB® for Photomechanics (PMTOOLBOX). Introduction. Image processing in photomechanics. MATLAB® demonstration. Conclusion. Digital Photoelasticity. Digital polariscope. Phase-shifting method with a normal circular polariscope. Dynamic phase shift photoelasticity. MATLAB® demonstration. Moiré Methods. Digital moiré. Moiré of Moiré. Gabor strain segmentation. Diffrentiation of low density fringe patterns. Digital Holography. Digital holography. Digital holographic interferometry. MATLAB® demonstration. Conclusion. Speckle Methods. Laser and white light speckles. Sampled speckles. MATLAB® demonstration. Curvature contouring.